Kirin 710 vs Snapdragon 660 Comparison - Which one is the better? In our previous article, we compared the Kirin 710 and the Qualcomm Snapdragon 636. Looking at the benchmark scores of both the chipsets, we found that the Kirin 710 is better when it comes to scores. So, why not compare it with the most powerful 600 series chipset from Qualcomm, i.e., the Snapdragon 660. Despite having the same Kryo 260 cores, the Snapdragon 660 is powerful than the 636 as it is clocked higher and also has a slightly better Adreno 512 GPU. We have seen this chipset in phones like the Nokia 7 Plus, Xiaomi Mi 6X, etc. and it is a well-known fact that it can run anything you throw at it with ease. The Kirin 710 that debuted with the Huawei Nova 3i is the best mid-range processor that Huawei makes right now. It is the first 12nm chipset from the company, and hence, the competition in the mid-range segment becomes more interesting as there is no 12nm chipset in the 600 series from Qualcomm yet. Even MediaTek is now launching 12nm processors in the budget segment. Talking about the specifications first, the Kirin 710 is built with the 12nm process so, it seems more powerful and power efficient than the 14nm Snapdragon 660. But as always, the real-world scenarios are much different as compared to the specifications on paper. Both the Kirin 710 and Snapdragon 660 can have a clock speed up to 2.2GHz, but the CPU arrangement is different in both. The Snapdragon 660 focuses on the performance, and so, there are 8 Kryo 260 cores. On the other hand, the Kirin 710 has four Cortex-A73 cores clocked at 2.2GHz whereas four Cortex-A53 cores clocked at 1.7GHz. Talking about the GPU’s, the Adreno 512 with a frequency of 850MHz is surely better regarding the performance as compared to the ARM Mali-G51 MP4 GPU with a frequency of 650MHz. We saw the same thing with the MediaTek Helio P60 that has a powerful CPU but falls short regarding the GPU. Also, the Adreno 512 is based on the 14nm technology whereas the ARM Mali-G51 MP4 GPU is based on the old 28nm technology. So regarding the GPU, the Snapdragon 660 beats the Kirin 710. But the same cannot be said about the CPU. 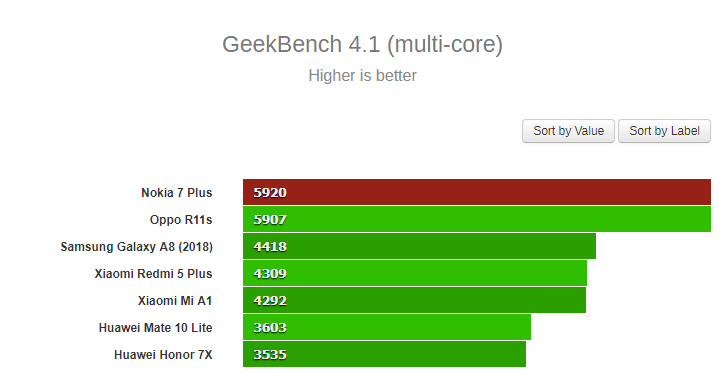 Talking about the benchmark scores now, the Kirin 710 scores around 138K on AnTuTu benchmark, showing that this is certainly a powerful mid-range chipset. 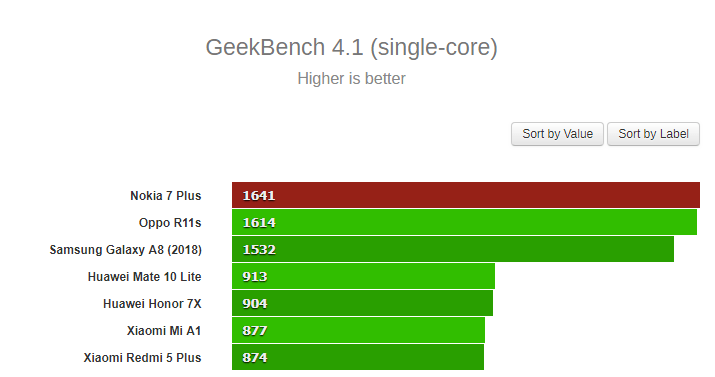 On Geekbench, it scores around 1590 on single core and 5594 on multi-core. Finally, on the Sling Shot Extreme, the chipset scored 943 with OpenGL ES 3.1 and 1,125 with the Vulkan. As seen in the images above, the CPU performance on both the processors is quite comparable, but when it comes to the GPU performance, the Kirin 710 lags behind. In fact, the Helio P60 has a much better GPU as compared to the Kirin 710 as per the scores. The Nokia 7 Plus is powered by the Snapdragon 660 processor and is one of the best mid-range smartphones right now. Talking about the Geekbench scores of the Snapdragon 660, it scores 1641 on single core and 5920 on multi-core. The scores are certainly higher than those of the Kirin 710. 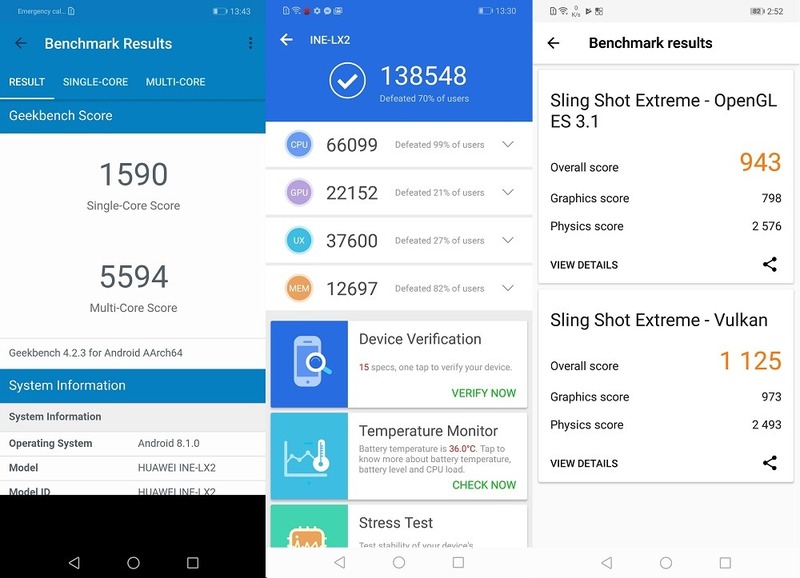 On the AnTuTu Benchmark, the Snapdragon 660 scores around 141K, which is the highest score that we have seen with any mid-range processor (not the 700 or 800 series processors). The difference isn’t much regarding the AnTuTu scores of the Kirin 710 and Snapdragon 660. Well, all these benchmarks tell the same story. The Kirin 710 has got an almost similar CPU performance as the Snapdragon 660, but it falls short when we compare the GPUs on both the chipsets. The Snapdragon 660’s Adreno 512 easily beats the Kirin 710. 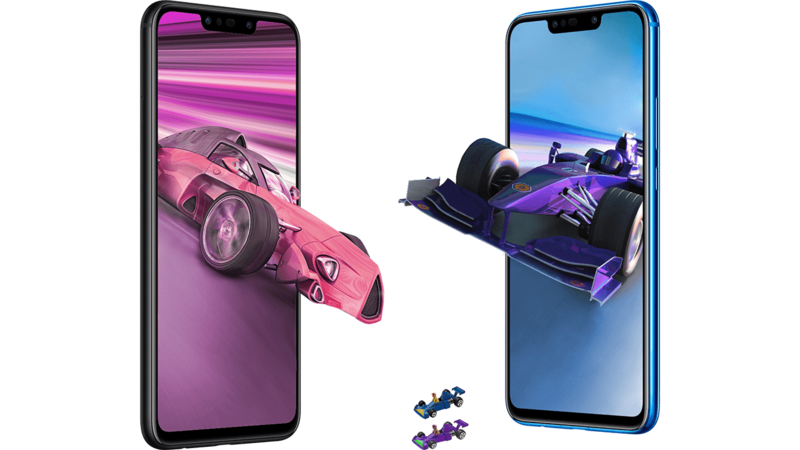 Considering that Huawei has added GPU Turbo Technology, we expect to see a better GPU performance. So, when it comes to the performance, the Kirin 710 certainly stands between the Snapdragon 636 and the Snapdragon 660. So, this was all about the Kirin 710 vs Snapdragon 660. We will be comparing this new Kirin chipset with some other processors like the Helio P60 in upcoming articles, so stay tuned to DroidHolic.